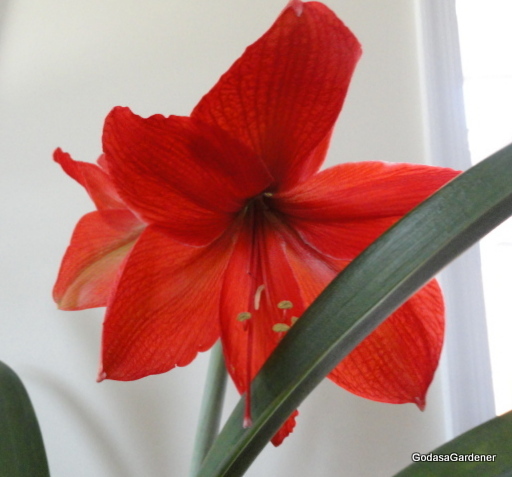 The Amaryllis has become a popular Christmas flower; however, mine never blooms until January. It is showy and brilliant and puts plants with only green foliage to shame; but they should never be ashamed. Plants with only, or mostly, green foliage have great value. It is the green-foliage in plants that gives oxygen into the atmosphere and adds appreciable to the pleasing environment of our homes. BTW: If you are growing amaryllis, be sure not to let the water level go above the top of the root bulb. I’m sure there is a lesson in Christian living in that. If you have an idea what it is, please write a comment. This entry was posted in Uncategorized and tagged Amaryllis, Bible Garden, Bible Study, God as a Gardener, plants. Bookmark the permalink. Great devotional. “. . . be sure not to let the water level go above the top of the root bulb.” To me this means “don’t get in over your head”. Too many times we take on more responsibilities than we should, or some that we shouldn’t, and we end up so busy that God gets pushed to the side. We need to learn to keep our head above water so that we can not only see what’s going on around us, but so that we can also see where God is leading us. So for me… Over-watering this beautiful plant is a symbol of not trusting that it’s Creator will ensure that it will thrive with what little water the plant requires… we always tend to think that God needs our help and “over-water” things in our lives to feel that we had some part in it’s growth or success… and more times than not, we will look back and see that we were the cause of the imbalance that entered in and brought about a different result than we had hoped for. And still, we blame God… Yet it is written that ‘God is not mocked, what a man sows, that will he indeed reap!” If only we learned how to trust Him and stay out of His way! If only we would slow down enough to both hear and heed the most gracious invitation of the One who simply said: I AM. Then, we would truly being to walk with Him in a different and most effective way, the striving would cease and we would know who we ARE not based on what we “do” but on what has been done for us by way of His Son…. Just a thought on what I have learned! Lovely and great devotional. Do not let the water level go above the top of the root bulb ………I am immediately reminded not to let pride swallow me up and drown me…….as we are so often trapped into being.